Many of the Georgia photographers I have documented have connections to the U. S. military, and a few even served in the military of other countries. The photographers who were veterans of war and peacetime in the United States, saw military service from the period of the Civil War (on both sides), up to World War II. Photograph courtesy of Genevieve Fisher Harris’s granddaughter, Sonia R. Martinez. I attempt a military-related post on this blog each Veterans Day, and on Memorial Day. You may want to revisit one of my favorites of 2014, the Veterans Day post on aerial photographer C.W. Reeves. I was happy to discover two photographs of a Georgia photographer wearing her military uniform. She was the daughter of one of my favorite photographers, C. Will [Carey William] Fisher (1849-1919), of Demorest, Georgia. Genevieve [Arla Genevieve] Fisher (1894-1982), was the youngest daughter of Will and Rachel Fisher, and she began to apprentice in her father’s photography studio in 1910, when she was about sixteen. She continued working at Fisher’s Studio until her marriage at age twenty-one (c1915) to Thomas E. Harris. The couple divorced before 1940, and on November 12, 1943, Genevieve enlisted in the Women’s Army Corps. Her occupation upon entry was given as Photographer, and she likely worked as a photographer during the war, which may be when she was placed in the special services division. I love both these photographs of her in uniform, because you can tell how proud she is to wear it! She served with the 3rd Army for sixteen years. Magic was something she became interested in while she was in the army, and she started learning magic tricks when she was stationed in Germany. Genevieve was sent to do shows for hospitalized GIs, and she performed at times quite close to combat. When she was stationed in Yokohama, Japan, she was flown to Korea and performed sixteen miles from the DMZ (The Korean Demilitarized Zone), and even performed for the troops in bad winter weather. According to one obituary, Genevieve was the oldest member of the International Brotherhood of Magicians at the time of her death. Genevieve Fisher passed away in 1982, and although she was a resident of Yankeetown, Florida, she was visiting her oldest daughter Arla Ruth Harris (Martinez) Gibbs in Greensboro, North Carolina when she died. Genevieve was given a military burial in Westminster Gardens cemetery, in Greensboro. Her parents and sister Vera are all buried near Demorest, in Clarkesville Memorial Cemetery. Speaking of Demorest, Georgia, it was also the home of baseball great Johnny Mize [John Robert “Big Cat” Mize, 1913-1993], who was born and raised in Demorest. Mize took a leave of absence from major league baseball to go into the Navy during World War II. Below is his Navy photograph (photos taken in his his team uniforms are so much better!). He served fore three years in the Navy and he came back to baseball in 1947. His career is most memorable for that post-war period. He is buried in Demorest, at the Yonah Memorial Gardens cemetery and you will find more biographical information on him, and his career in baseball, at his Find a Grave site. A biography with statistics on his career is found at the Baseball Hall of Fame. In my last Tuesday Tips post, I mentioned the Mize collection at Piedmont College, located in Demorest. On that campus, you will find the Johnny Mize Baseball Museum, located in the Johnny Mize Athletic Center. U. S. Navy photo of Johnny Mize in his WWII U. S. Navy uniform; Johnny Mize Collection, (Identifier Mize_P_0003) Piedmont College Library and Archives, Demorest, Georgia. I think somewhere, but perhaps not in the Piedmont College collection, there could be photographs of Johnny Mize as a child that were taken in the Fisher Studio by either C. Will Fisher (Mize was almost seven when Will Fisher died in 1919), or by Arla Genevieve, or by her sister, Vera, who also worked in their father’s photography studio. It is Vera who likely took over the Fisher Studio when their father died. Vera Fisher Griggs continued to work as a photographer as late as 1930, when she was in nearby Clarksville, Georgia, which like Demorest, is in Habersham County. I would like to thank the relatives of Genevieve Fisher for sharing information with me. I hope this short post prompts you to think about those around you, as well as those in your own family, who have served their country. Go out and about and hunt and gather their photographs, and think about them not just on this Veterans Day, but often. © E. Lee Eltzroth and Hunting & Gathering, 2018. Unauthorized use and/or duplication of this material, without written permission from this blog’s author is prohibited. The piece can be re-blogged, and excerpts and links may be used, provided that full and clear credit is given to E. Lee Eltzroth and Hunting & Gathering, with appropriate and specific direction to the original content. A wonderful tribute for some of those that we owe so much! Thanks, wish it could be longer. Maybe next year. Hope you also read the 2014 one if you have not. 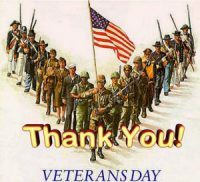 As always – thank you for your thoughtful articles and as a Veteran thanks for the thanks!! So happy you liked it. I am an Army brat and my husband is an Air Force brat and we both grew up in and with the military. After all these years it is still odd to me not to stop each day for raise/lower of the flag each day! ← See it here: Halloween!